This week it is Valentine's Day in the US. In Brazil, Valentine's Day (Dia dos Namorados) is in June so in my house we celebrate it twice! 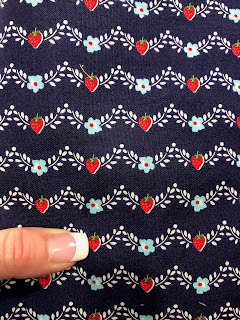 In the spirit of this celebration, let's have another giveaway: 1-1/2 yards of this cute fabric by Riley Blake Designs with little flowers and strawberries. Who needs chocolate, right? I will mail it to you wherever you are in the world. Just answer this question: Do you use directional fabrics in blocks, or do you leave them for the borders only? Remember, if you are not a blogger leave your email address using this format: "soandsoatinternet.com" - you will not get spammed and I will have a way to get in touch with you. The winner will be revealed on February 14 - Valentine's Day. Happy Monday! I will use directional prints in blocks as long as I can orient them so they point in a consistent direction. If they go every which way, I find it chaotic and/or distracting. I use every fabric everywhere, all directions. 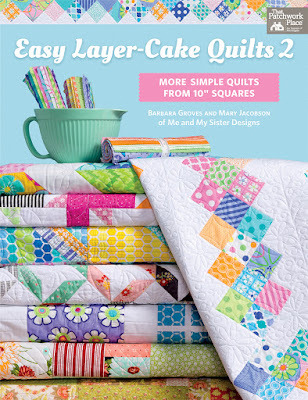 It gives me fun quilts. Thanks for the giveaway. Happy Valentine's. I use them whenever or however I want. Thanks for a chance to win. I use them both ways. Thanks for the give away. Really pretty fabric. 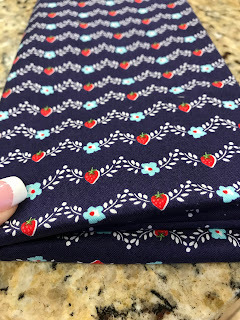 Oh, how sweet is this Riley Blake fabric?? I'm always big on hearts and this is one I really like. I tend to use more directional fabric in borders rather than blocks, but it happens! Directional fabrics are great everywhere, although I do pay attention to the orientation. And using it on the bias makes a jazzy binding. Yes, I use directional fabrics in blocks and everywhere. I don't discriminate!! Eu uso mais para o forro.feliz dia dos namorados!! I like fonts in print so I will intentionally make them go in all directions. I do use them at times - it makes it interesting and fun! I use them both ways, thanks! I love using directional prints in quilts! They can create such interesting patterns; an added bonus is a great workout for my brain cells, to get the fabric going the way I want it to! I generally use directional prints in piecing, occasionally in borders, though so many directional prints are printed off-grain it's difficult to get them looking straight in a border. I will use directional fabric for blocks or borders. I just have to pay closer attention to keep the direction consistent. Thanks for the great giveaway! Happy Valentine's Day from Canada where we also celebrate this day. I use directional prints in blocks on occasion, depending on the "look" I am trying to achieve. 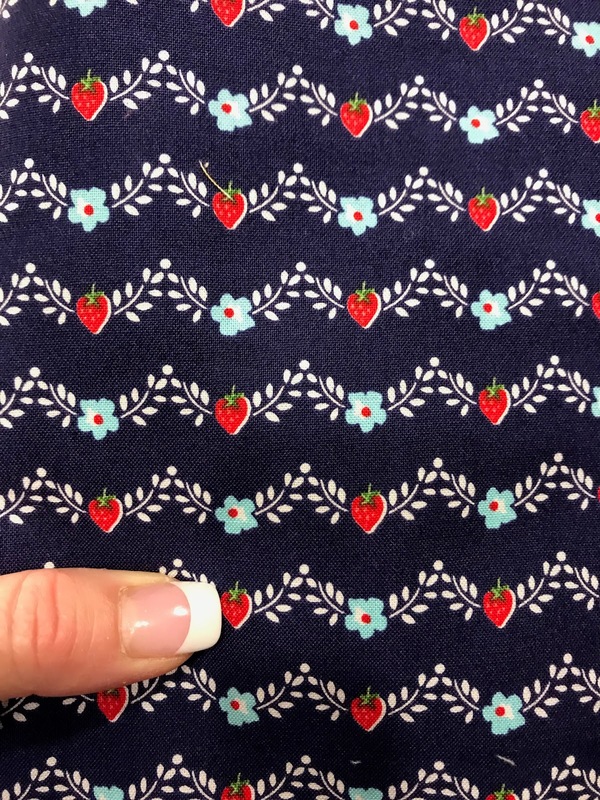 The fabric is very cute. I have used directional prints in blocks but prefer to use them in borders. I totally use directional fabric...Just have to be careful while using it! Thanks for sharing the giveaway!! I have used directional prints. Directional prints only for borders?! I think not; let's put them in blocks and let them dance all about! For my it depends on the design of the quilt as to if I use directional fabrics! Thank you for the lovely giveaway! Using directional fabrics in blocks is perfectly fine with me. I used some directional zebra fabric on the back of a baby quilt & had to add a simple black/white strip in between to keep the top & bottom zebras going the same way. I don't think I would have been so choosy if I'd used the fabric in blocks on the front of the quilt. Thanks. I do use directional fabric sometimes, but I am very careful when cutting to get the lines all going evenly in the block. Thanks! I do use directional fabrics unless it makes the project more difficult. I'm willing to use them if the pattern/ block isn't to complicated to figure out, lol!